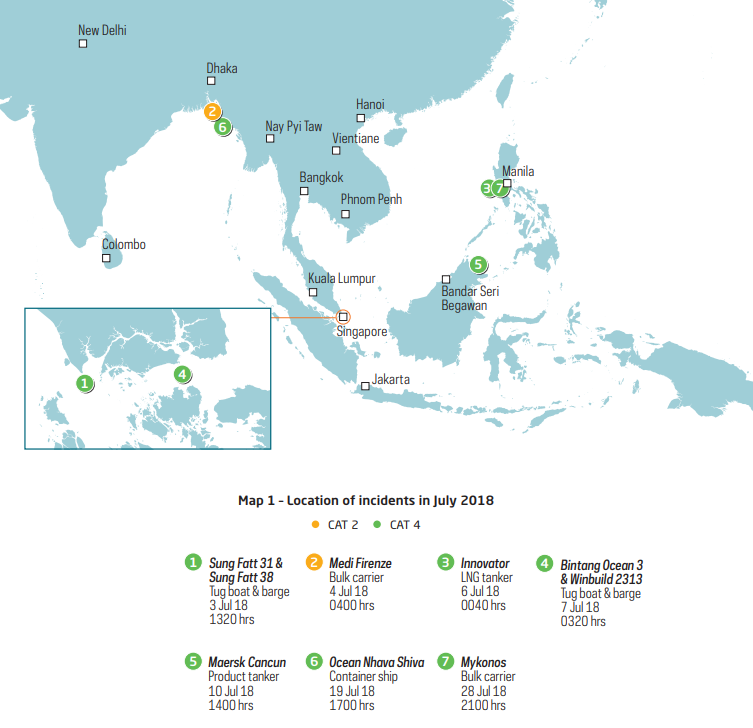 A total of seven incidents of armed robbery against ships in Asia were reported in July 2018, according to ReCAAP ISC"s monthly piracy report. The report reveals a 4% decrease in the total number of incidents during January-July 2018, compared to the same period in 2017, but unveils an increased activity in the Singapore Strait. A total of 47 incidents (comprising 36 actual and 11 attempted incidents) were reported during January-July 2018 compared to 49 incidents (comprising 42 actual and seven attempted incidents) reported during January-July 2017. The severity level of incidents has also decreased during January-July 2018 with no CAT 1 incident and the lowest number of CAT 2 incidents compared to the same period of 2009-2018. There was no actual incident of abduction of crew for ransom and no hijacking of ships for oil cargo theft during January-July 2018. Of concern was the continued occurrence of incidents in the Singapore Strait. Two incidents of theft of cargo from barges towed by tug boats while underway in the Singapore Strait were reported in July 2018, bringing the total number of incidents in the Strait of Malacca and Singapore to seven during January-July 2018 compared to two incidents reported during the same period in 2017. In July 2018, a total of seven incidents (all actual incidents) of armed robbery against ships were reported. 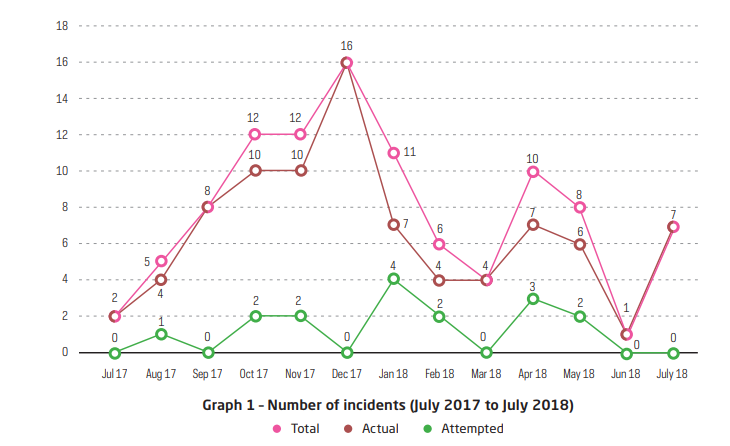 There has been an increase in the number of incidents, compared to June 2018, when only one incident was reported. Of the seven incidents reported in July 2018, two incidents occurred onboard ships while underway and five incidents onboard ships at anchor/berth. A total of 47 incidents comprising 36 actual incidents and 11 attempted incidents, had been verified and reported to the ReCAAP ISC during January-July 2018. There was a 4% decrease in the total number of incidents reported, compared to January-July 2017, when a total of 49 incidents, comprising 42 actual and seven attempted incidents, were reported. "The ReCAAP ISC advises all ships to exercise enhanced vigilance and report all incidents to the nearest coastal State. Tug boats towing barges loaded with cargo are relatively more vulnerable as they are slower in speed, with lower freeboard and unmanned barges. On the part of the authorities, the relevant enforcement agencies are encouraged to beef up their surveillance, increase patrols and render assistance promptly to reports made by victim ships. Tug boats are advised to enhance vigilance with their towed barges."